The way to prevent intra-operative awareness has been paved by joint efforts of medical science and physics. Intra-operative awareness, familiarized through some thriller movies, is a unique physiological phenomenon which causes the patient under general anesthesia to recover consciousness during surgery. The patient experiencing intra-operative awareness may feel the pain or pressure of surgery, hear conversations, or feel as if he cannot breathe, but may be unable to communicate any distress because he has been given a paralytic or muscle relaxant. 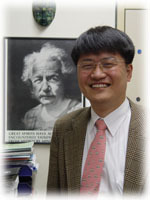 Professor Seunghwan Kim (Department of Physics), in a joint research with Doctor UnCheol Lee of University of Michigan, who is a POSTECH graduate, and Professor Gyu-Jeong Noh of Seoul Asan Medical Center, has demonstrated the mechanism behind loss and recovery of consciousness through anesthesia, and detected the exact moment when a subject loses consciousness after being administered an anesthetic. Utilizing the analytic method called nonlinear dynamics which is used mainly to identify complex physical phenomena, Professor Kim’s team investigated the functional organization of brain activities in the conscious and anesthetized states. Recordings were obtained from 14 subjects who underwent induction of general anesthesia with propofol, and in the analysis, the team demonstrated that loss of consciousness is reflected by the breakdown of the spatiotemporal organization of gamma waves, and that induction of general anesthesia with propofol reduces the capacity for information integration in the brain. Additionally captured was the moment the amount of information going from the frontal to the occipital lobes rapidly dropped, which coincided with loss of consciousness. The data congregated through the research directly supports the information integration theory of consciousness and the cognitive unbinding paradigm of general anesthesia. The results of the study were published in the November 20, 2008 online issue of Consciousness and Cognition.